The Cuisinart HM-90BCS power advantage; 9-speed hand mixer is ideal for heaviest mixing purpose. From dense cookie dough to whipped cream, the 220 watt motor with automatic feedback can perform any mixing task. It has SmoothStart® feature with 3 low mixing speeds to avoid splattering. The combination of one-touch speed control button and LED digital display provides ultimate control over mixing. The Cuisinart 9-Speed Hand Mixer With Storage Case has many exciting features for users of all types. 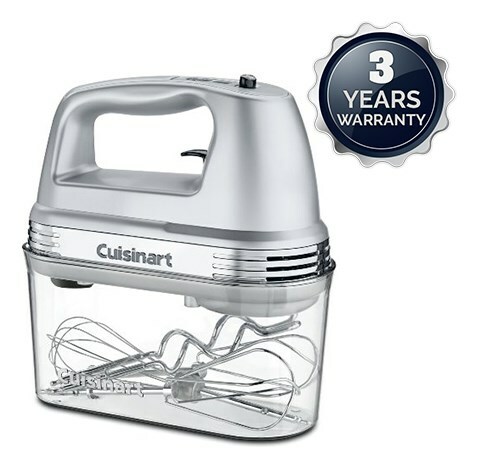 You can extend the lifetime of your Cuisinart 9-Speed Hand Mixer With Storage Case with the purchase of a FactoryOutletStore Factory Protection Plan. See the Cuisinart 9-Speed Hand Mixer With Storage Case gallery images above for more product views. 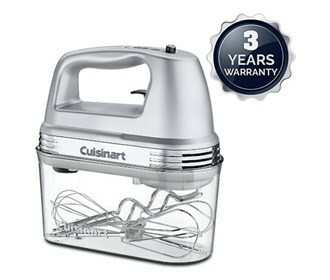 The Cuisinart 9-Speed Hand Mixer With Storage Case is sold as a Brand New Unopened Item.